Modern and Postwar Art. Impressionism. Expressionism. Pop Art. Old Masters. Eastern and Islamic art. Art has become an important asset class. Although most collectors buy art for love, their investment also has to make commercial sense. We are based between London, Germany and Switzerland with an international network of art professionals in the USA, China, Europe and the Middle East. These include private collectors and corporate clients, leading museums, curators, and art market specialists such as valuers, art law and tax advisors, auctioneers and restorers as well as art finance specialists and lenders, journalists, event organisers, art critics and security personnel. We can assist with security transportation of art, with operators following the art vehicle through any destination globally, including private aircraft charter for UHNW Clients. The art would be tracked with live-time reporting back to the client or family office, providing piece of mind until complete at the destination. Thereafter we also offer Residential or Venue Security if the client wishes to secure the art even further. We offer a personal service assisting with all aspects of buying and selling art works and collections- from private sales to auction acquisitions and the best way of selling. We help with auction bidding and negotiate deals when selling at auction. We source exclusive off market opportunities for our clients that cater to their specific interests in line with their short, medium and long term strategy of collecting. We assist with due diligence and market analyses as well as questions of authenticity, certification, condition, conservation, insurance, transportation, export and security, escrow services as well as framing and hanging. We can arrange the release of equity from an art work or a collection and even generate an annual income from art while keeping the art work in place. Kristiane Backer has been active in the field of Arts, Culture and Music since she began her professional life in Germany and now works as a Fine Art consultant based in London. Her focus is on Modern and Impressionist paintings as well as Post War and some Contemporary Art. Kristiane enjoys discovering talents and help giving them a platform. She takes a personal interest in Islamic and Eastern art and has curated a major Art exhibition by the Egyptian Calligraphy Artist, Ahmed Moustafa, in Sarajevo in 1998. Kristiane has an excellent network of contacts world-wide and has successfully sold blue chip paintings of different genres to collectors, galleries and investors. She also advises collectors in building their collections. Kristiane is involved in several cultural projects and is engaged in intercultural dialogue. With a background on international TV as a presenter and public speaker, she regularly chairs conferences and interviewed a variety of artists for cultural projects of the German Embassy in London. During her education as a Radio Journalist in Germany her first celebrity interview was with Pop Artist Keith Haring. .
At the age of 24 Kristiane became one of the leading presenters on MTV Europe. She interviewed most major artists and musicians of her time for over seven years. She created her own youth show in Germany and later presented a daily guide to culture and entertainment, ‘The Ticket NBC’ on NBC Europe. 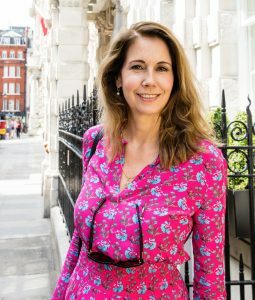 Kristiane hosted a travel show for a number of years on Travel Channel and She studied all aspects of the art market during art business courses at Sotheby’s institute and Christie’s including art law, art valuations, art curating and art history. The latter she also studied at City Lit.